Full Marathon event is limited to 400 runners. Cut-off time is 6 hours. Blue Ox Marathon scenic 26.2 mile road course on all paved trails and roads. The route is fairly flat consisting of about 50% paved bike trail and 50% paved road. Most of course is partially shaded with some open areas along lake shore. This marathon is certified by the USTAF as a Boston Qualifier! To begin your online registration, click the button to be redirected to the ZapEvent registration page. Want to register the old school way? No problem. Click on the button below to download a print version of the registration form to mail in. Save money by registering ONLINE. 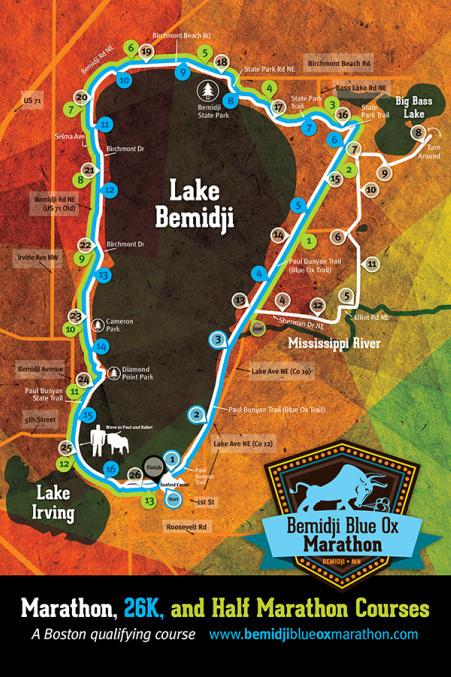 © Copyright 2014-2015 Bemidji Blue Ox Marathon. All rights reserved.